The latest volume in the shared-world anthology series, War World. War World: The Battle for Sauron, is set to be published in the fall of 2007. For those of you unfamiliar with the War World series, this volume would be an ideal introduction, since it chronicles the arrival of the Sauron invaders on Haven, a barely habitable moon of a Jovian planet Cat’s Eye. It’s a space adventure in the mold of H. Beam Piper’s work and based on an idea developed by myself and Jerry Pournelle. The new novel, “War World: The Battle of Sauron” takes place in the waning days of the First Empire of Man, a future history inspired by Piper’s own Terro-Human Future History. Final cover for War world: The Battle for Sauron. 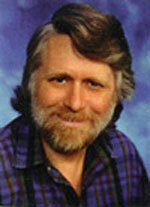 This picture was taken from John F. Carr's website Hostigos, and illustrated by Alan Gutierrez. Written across title page in blue marker is “First Draft – Battle of Sauron 06/06/07 JFC.” This first draft is not titled War World: the Battle of Sauron, but is titled “Sauron Armageddon.” There are no edits to this draft. The entire draft feature some damage to the paper, possibly do to smoke around all four edges of each page. Edited draft for the novel War World: The Battle of Sauron by John F. Carr and Donald Hawthorne. Edited by Donald Hawthorne, his corrections appear in red ink and marker on the text. The title page features an editor’s mark at the bottom of the page correcting “&” with “and” in red ink. Edited draft for the novel War World: The Battle of Sauron by John F. Carr and Donald Hawthorne. Editor of the draft is unknown, while the editor’s marks appear in red ink. Post-it flags mark the pages where the editor has made corrections to the text. On page 205 the color of the paper is blue, while the rest of the draft is white. The dates of when these pages were printed are from 11/30/06 and 12/01/06. The file names for these pages are labeled as “Battle of Sauron INT 2P.indd.” The cover page for this draft has “Next to final” written in pen on the top right corner, followed by John F. Carr’s initials. Edited draft for the novel War World: The Battle of Sauron by John F. Carr and Donald Hawthorne. Editor of the draft is unknown, while the editor’s marks appear in red ink or have been retyped and taped onto the pages. Post-it flags mark the pages where the editor has made corrections to the text, although not all corrections are marked with the post-it flags. The dates of when these pages were printed are from 11/30/06 and 12/01/06. The file names for these pages are labeled as “Battle of Sauron INT 2P.indd.” The cover page has “Note: Please change ornament (------) style.” written in red pen across the top presumably by the editor. In this folder are two copies of an editor’s correction list for the novel. One copy is complete while the second copy is missing several pages. Both copies however are of the same correction list. Incomplete edited draft for the novel War World: The Battle of Sauron by John F. Carr and Donald Hawthorne. Editor of the draft is unknown, while the editor’s marks appear in red ink. Post-it flags mark the pages where the editor has made corrections to the text. This file contains three sections: email from Mark Graves from Ad Astra Games, his list of proposals / corrections for War World: The Battle of Sauron, and notes on distances between worlds in the War World universe. This is a hardcover edition of War World: The Battle of Sauron by John F. Carr and Don Hawthorne. This is a first edition copy, printed by Pequod Press in 2007. This title is filed with other hardcover copies of works by John F. Carr. This is a copy-edited draft of War World: The Battle of Sauron by John F. Carr and Don Hawthorne. Written in ink on the title page is “1st Version – Copy Edited by Don Hawthorne.” Corrections in the text appear in black and red ink. This draft was printed on June 6th, 2006. This is a copy-edited draft of War World: The Battle of Sauron by John F. Carr and Don Hawthorne. Written in ink on the title page is “1st Version – received 6/2006 – 1 copy to Victoria Alexander – 1 copy to Don Hawthorne – 1 copy to J.F.C.” And on the bottom of the title page is “Copy Edited by J.F.C.” Edits to this draft appear in red ink, and are marked with red post-it flags. The draft was printed on June 6th, 2006. A group of three printouts, each titled Coming of the Eye: A War World Novel, the original title of War World: the Battle of Sauron, by John F. Carr and Don Hawthorne. The first printout, 61 pages, is signed by John F. Carr and labeled “Original Battle of Sauron draft, approx. 1996.” This printout includes the prologue and chapters 1-6 of the novel. The second printout, 90 pages, includes the prologue and chapters 1-9 of the novel. The third printout, 24 pages, includes the prologue and chapter 1 with chapter 1 formatted into 2 subsections. A portion of John F. Carr and Don Hawthorne’s novel, War World: The Battle of Sauron, bearing its original title, discovered with the Rainbow Run excerpts in Carr-08-09. The excerpt includes the prologue and chapter 1 of the novel. No editing or other marks are present on the document. This is a copy-edited draft of War World: The Battle of Sauron by John F. Carr and Don Hawthorne. Written in ink on the title page is “Final Ms – Copy edited by Victoria Alexander.” Edits to this draft appear in red ink, and are marked with blue post-it notes and post-it flags. 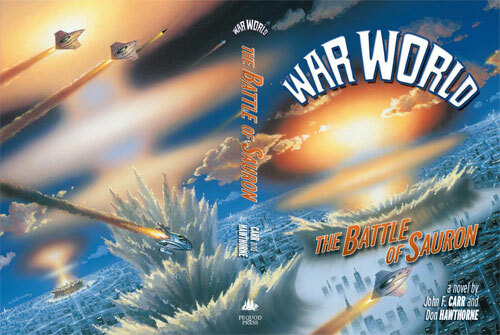 The cover art for War World: The Battle of Sauron. This file also includes a diagram of the titular battle, and map’s of Landyn’s Star System, where the anthology takes place. A document titled “Sauron.” The document contains notes on the planet Sauron, and it bears some black editing marks. An email from Doug McElwain to John Carr with his comments, edits, questions and problems regarding War World: The Battle of Sauron. Contract with Desktop Miracles company for War World: The Battle of Sauron. Starting with Chapter Thirty Two this is an edited version of War World: The Battle of Sauron. This is a revised and trimmed second edition of War World: The Battle of Sauron that has various edits with some pages missing. Updated by Ellen Winger Fall 2008, Summer 2010.